Look for this biennial plant, June through September, in pastures, meadows, and along roadsides. It can grow up to 5 feet tall! The photos above show the leaves arranged on the flowering stem in an alternate pattern, without petioles and gently clasping. These leaves are elliptic and slightly toothed. The dazzling flowers of Moth Mullein appear in the plant’s second year and are about 1-inch wide. The color of the flowers may be white or yellow. Each flower is attached to the stem by a short pedicel. Even the unopened, star-like flower buds of this plant are gorgeously constructed. The center of the flower is always reddish; there are 5 petals and 5 very feathery stamens bearing orange anthers. Wow, what a flower! Moth mullein gets its name from the attractive stamens at the center of the flower. On close inspection, they look like MOTH ANTENNAE! 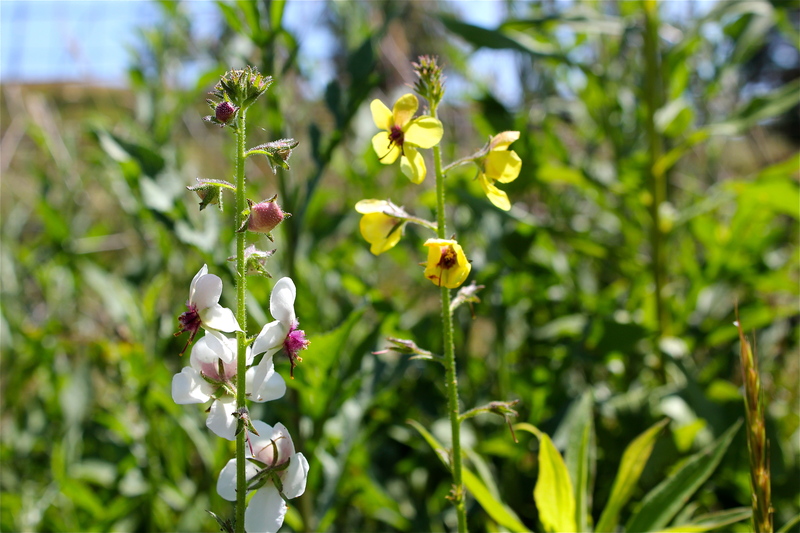 Don’t confuse this plant with common mullein, which also has 5-petaled yellow flowers. Common mullein has very large, grayish green, hairy leaves, and the flowers appear on a tall, tough spike without pedicels (they are practically sessile). Gloria, your photographs are wonderful and your collection is growing rapidly. Keep it up! Thanks Anne! It might be verging on an addiction now!